This stunning ladies' watch and pendant gift set from Sekonda is the perfect gift for the most important lady in your life this Christmas. The gorgeous two tone stainless steel bracelet watch features a crystal set bezel and dial, with an element of gold on the hands for an exquisitely luxurious feel. The shimmering pendant, set on a silver tone chain, is the picture of sophistication and elegance, a sparkling perfect pairing. 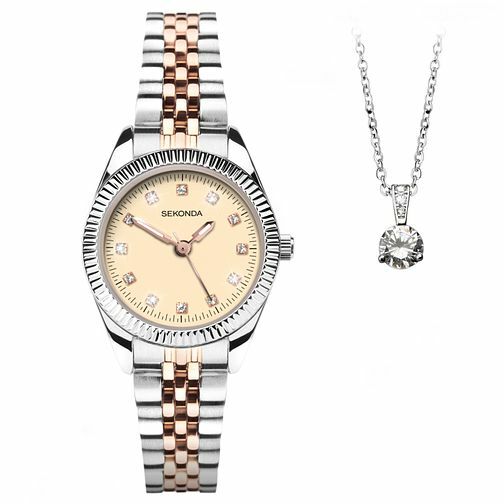 Sekonda Ladies' Two Tone Bracelet Watch & Pendant Gift Set is rated 4.3 out of 5 by 14. Rated 5 out of 5 by Anonymous from Excellent gift set beautiful Bought this gift set for my mum and she loved it. Very good quality beautifully presented in the gift box. Rated 4 out of 5 by Anonymous from Nice looking gift set Nice solid gift. Reliable brand that’s why I brought them. Great as gifts for my sister in laws.